Their Path, Cost, Damage and Strength! We’ve created a visual list of Category 5 hurricanes from the past 50 years, rated by damage done to humans. Our Human Impact Index factors in hurricane data such as deaths and wind speed to give us a quick overview of how much damage hurricanes have done over time. What Is a Category 5 Hurricane? The Category 5 hurricane definition is based on wind speed: It is a tropical cyclone that must have a wind speed of 157 mph or higher. A Category 5 on the Saffir-Simpson scale is the highest-category hurricane; there’s no such thing as a Category 6 hurricane. These storms are often catastrophic, with more intense landfalls, storm surges, and flooding. What Is the Worst Hurricane? Our index studies the wind speed, duration of the storm, cost of damages, and fatalities. This is what we’ve found after looking at the data from the past 50 years. Which Category 5 hurricane caused the most deaths? In 1998, Hurricane Mitch led to 19,325 deaths when it landed near Honduras, Nicaragua, and Guatemala, three places not very prepared for such catastrophic disasters. It whipped around in the bottom of the Gulf of Mexico and also hit Florida. It’s the deadliest hurricane since a very early recorded storm that affected Barbados in 1780. Which Category 5 hurricane caused the most damage, monetarily? The worst Category 5 hurricane damage was the result of Hurricane Katrina in 2005, which demolished the metropolis of New Orleans and surrounding areas, which were not known for being hit by hurricanes very often in the past. It caused $108 billion in damages. What is the strongest hurricane? For wind speed, the 2015 Pacific storm Hurricane Patricia had a yet-unknown 215 mph speed. Patricia later slammed into Mexico. Of the Atlantic storms, 1980’s Allen has been the strongest, with 190 mph winds. Which hurricane was the worst according to our index? Because of its death count, the deadly Mitch in 1998 has the highest index (247.8), but the much more recent Hurricane Irma is not far behind (244.5). Irma cost $64.8 billion, took 146 lives, and had an extreme wind speed of 180 mph. The Hurricane Irma track swung into almost all of the major Caribbean islands, including Puerto Rico, and up into Florida, leaving a trail of devastation. It was pretty intense for a recent storm, especially compared with the past half-century’s history. Are Hurricanes Getting Worse Over Time? It would seem so. The last Category 5 hurricane was Hurricane Maria, which is the answer to the question of “which hurricane hit Puerto Rico?” The island had to deal with a devastating one-two punch of the very costly, very deadly Hurricane Irma, which ranks highly with our index, followed up by Maria, which nearly hit the island head-on. Getting power, supplies, and help to the island has been a slow ordeal. 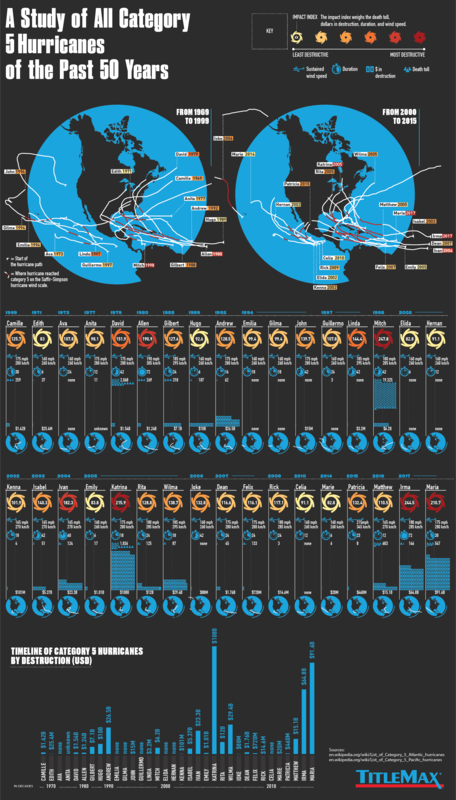 Note that our infographic only includes Category 5 hurricanes. Not included is 2017’s Hurricane Harvey, which, despite being only a Category 4, tied with Katrina for being the costliest cyclone ever after it slammed Houston. Was Hurricane Harvey worse than Katrina? It’s hard to say, but using our index would give it a score of about 160, whereas Katrina has a score of 215.9. Hurricane Jose, another 2017 Category 4 mega-storm, luckily didn’t do nearly as much damage, but it certainly came close, smashing Caribbean Islands before swirling up the East Coast. In 2017, we saw two Category 5 hurricanes, six major hurricanes, and 17 storms. The hyperactive season also happened to be the costliest on record, at $282.22 billion. If one doesn’t believe NASA, NOAA, independent studies, or even the haphazard predictions between the 2004 movie The Day After Tomorrow, one can’t deny the evidence of pockets of increasingly frequent and more severe Category 5 storms since 2000. Between 1969 and 2000, there were 15 total Category 5 storms (a span of 30 years). Since 2000, we’ve seen 19 highly devastating ones (a span of 18 years). What Should Your Family Do? Create an emergency plan with your whole family. Communicate the plan to your children. Don’t forget to make a plan for your pets! If possible, consider purchasing flood insurance, which is usually not included in home insurance packages. If an announcement is made that a hurricane is approaching, know what to do and when. For instance, if you evacuate, turn off power to your home and pay attention to authorities when you leave. Make sure you have a backup plan if you don’t have cellular service, your smartphone, or a GPS due to a power outage. Printing out directions or buying a map might be a good idea. Pay attention to the NOAA National Hurricane Center for updates, or listen to updates on the radio. The key to maintaining financial health is not only in the planning and managing of one's personal assets but in understanding the basics and evolution of the economy. The economy affects every part of our lives, yet many school districts do not offer economics and graduating without it is possible. In our households, money is rarely discussed, except for the idea of running out of it. Let's all start taking a proactive approach to becoming well-rounded in economics and finance, in order to make better everyday decisions for ourselves, and generations to come.